In 1980 the business was still just one small shop at 2 Wrexham Street, Mold, run under management by the legendary Cyril Davies and his assistant Dilys Davies, and a part time bookkeeper. The original shop founded by John Vaughan Davies in Holywell in 1938 had by this time long gone. When Richard Vaughan-Davies, son of the founder, returned in 1981 to take the helm after running shops in the South of England and Chester, he was full of enthusiasm for trying out some new principles of retailing. This meant specialisation, in this case into ready- made suits, along with vigorous advertising and promotion. Luckily the time was right for such a move, as many UK suit manufacturers were running into difficulties, and were ready to cooperate generously on price and delivery. Stocks were rapidly increased from 50 suits to 500, and soon afterwards to over 1000. By offering every size in regular, short, long, and portly fittings in a wide price range at discounted prices, promoted through large scale advertisements in the local Press, the business expanded rapidly. Quality and friendly service by a wonderful staff were never sacrificed, and the company soon gained a wide reputation, becoming the No 1 independent menswear retailer in the UK in 1987. 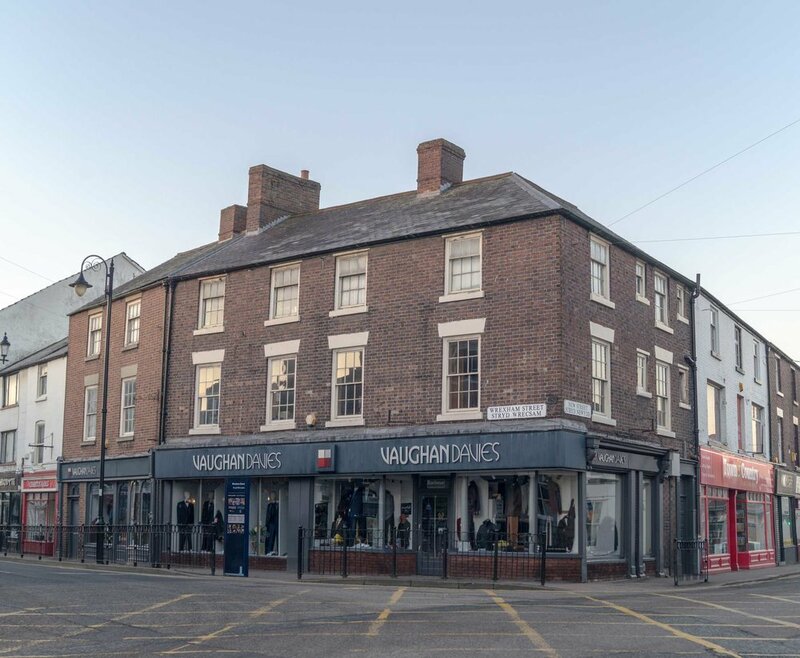 It was an exciting time as the company acquired the freehold of the block and absorbed the two shops on either side, as well as insurance offices and hairdressers on the first and second floors. The present store was formed by adding the three storey building next door in 1988. The suit stock had by now expanded to an astonishing 2000 suits, and included a very successful trade in sheepskin and leather coats for men and ladies, at one time retailed from the premises of the present Lloyds bank. During this period Martin Jones became general manager of the business and supervised its continued success, finally becoming the owner of the company on Richard’s retirement. In a period when many independent shops have disappeared, Vaughan Davies continues to thrive under his skilful direction, based on the same principles of extensive stocks, total commitment to quality, and the personal touch of loyal and skilled staff, who have been part of the business for many years.